A building site must be run professionally. Health and safety procedures must be adhered to at all times. 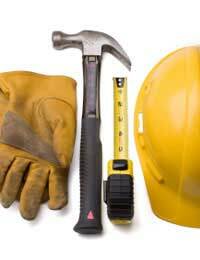 If an accident occurs your site and work will be investigated and as the owner you will be liable to prosecution. It is your duty as site owner and manager to be strict with all people on site. Alcohol should not be consumed and workers should not be intoxicated. All duties should be under taken professionally at all times. All workers should be wearing clothing that is suitable to work in and protect them whilst undertaking their duties. Ensure that your site insurance is up to date and covers all eventualities. Anyone visiting the site should be signed in so that a record can be kept of anyone who has been on site. The site should be declared a hard hat area and hard hats should be given to all visitors and if they are within hazardous areas adequate protective clothing should be worn. These items should be stored in the official green first aid box. Ideally one worker on site should have first aid training. Ensure there is always a telephone on site form use in case of emergency. A list of next of kin details of your workers should be held by whoever is managing the site. Under no circumstances should children be allowed on the building site. If you happen to live on site with children the living area should be fenced off from the build. The building site should be surrounded with a strong high fence, the gate secured with a padlock. Tools, materials and machinery must be locked away each night or taken away from the site. Subcontractors who leave tools on site do so at their own risk, they must have their own insurance cover but ultimately you are responsible for their safety. Always check that the workers you employ are qualified for the skills they are hired to perform. Skimping on skilled labour will not only affect the quality of the work on your home but could also cause danger if the workers do not follow safety procedures. The house must have scaffolding for the bricklayers and roofers to work from. It is no longer permissible for builders to work just from ladders. Ensure that the company that you hire your scaffolding from supply trained erectors to set up the scaffolding on your site. Never allow anyone apart from the scaffolders to dismantle or tamper with the scaffolding. In case of fire all workers must be aware of fire points and procedures. Workers should be able to work in well-lit and well-ventilated areas at all times. There should also be protection against the elements. There should be provisions for all workers to have access to washing facilities, drinking water and a toilet. With a little thought and organisation your self-build site should be a safe place to work.